In a bowl, combine the flour, sugar, baking powder, salt, cinnamon, and nutmeg. 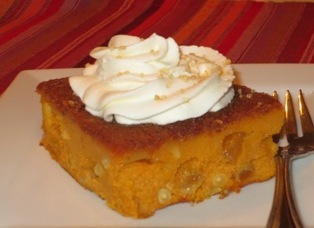 In another bowl, combine the ricotta, pumpkin, egg, and vanilla; stir to blend well. Pour the pumpkin mixture into the flour mixture; stir until well combined. Cover and set the mixture aside for 30 minutes to an hour. Drop tablespoons of the batter into the hot oil, a few at a time; don't crowd them. 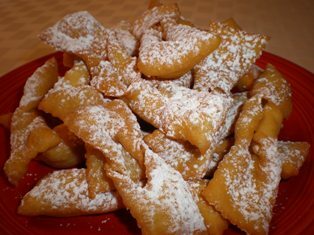 Fry the zeppole, turning occasionally, until they are light golden brown, 1-2 minutes per batch. Transfer the cooked zeppole to a paper-towel lined plate. 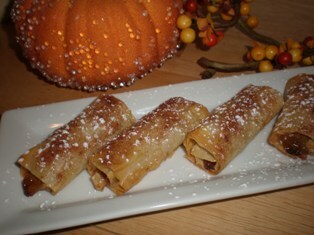 While they are still warm, dust with confectioners' sugar or roll them in cinnamon-sugar. Zeppole are best served warm. Leftovers can be reheated the next day in a 350 degree F. oven for about 5 minutes. Re-dust the zeppole with sugar before serving. Great for displaying zeppole or other pastries, cookies, fruits, or savory appetizers. 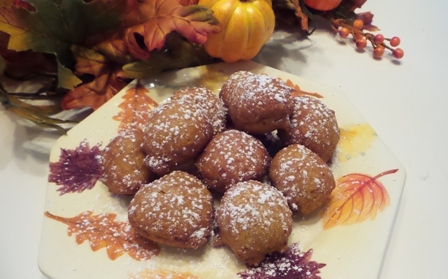 With the simple addition of pumpkin puree and some spices, you can turn traditional zeppole into something special for an autumn treat or to add to your Thanksgiving dessert table.